From the airport you can get bus N°1 Aeroporto –Città Alta until the bus terminal Colle Aperto. It runs about every 20’ during daytime and it costs €2,30 per pers. The B&B is 200 meters from the bus stop. Go through Porta S.Alessandro (beside “Bar-Ristorante La Marianna”) walking on the left side and go straight trough Via Tre Armi until the STOP signs. On the right there is “Via degli Orti”, the B&B is the first house on the left, number 1. The Bergamo Train Station is about a couple of kilometers away and is connected with direct service to city buses. The Bus stop is in front of the exit from the railway station building. You can buy ticket from the newspaper stand inside the railway station itself, at automatic machines or at any tobacco shop. Take bus N°1 STAZIONE-CITTA’ ALTA (not FUNICOLARE or AIRPORT) until the bus terminus Colle Aperto. The B&B is 200 meters from the bus stop. Go through Porta S.Alessandro and go straight until the STOP signs. On the right there is “Via degli Orti”, the B&B is the first house on the left, number 1. This is an alternative way to the GPS who guide you along a path with shorter but often narrow streets. 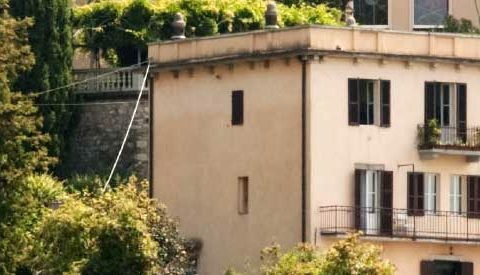 The B&B “A casa mia” is in Upper Town .Coming by highway number A4, either from Milan or from Venice, get out at Bergamo exit (there’s just one). After paying the toll follow the white sign towards the city center (Bergamo centro), that is the third road on the right. Drive along this two lane road as far as the first traffic light, and turn to the right, following the “Città Alta” signs: they will lead you as far as a large boulevard (Viale Papa Giovanni). Follow it all away towards the upper part of town (Città Alta): it will bring you to one of the gates of the old upper part of town (Sant’ Agostino gate). Go through it and keep left along the Walls, go straight for Km1,7 until you get to Colle Aperto. Turn left, there is a small roundabout and another historical gate Porta S.Alessandro, beside “Bar-Ristorante La Marianna”. Go through Porta S.Alessandro and go straight in Via Tre Armi until the STOP signs. On the right there is “Via degli Orti”, the B&B is the first house on the left, number 1. Keep as close as possible to the wall since it is a one-way road. As soon as you arrive we will show you where you can have a free-park in the area close to the B&B. On request, a shuttle service fee with private taxi to and from the Train Station and the Airports of Bergamo and Milan.